To help celebrate Stampin' Up's 20th anniversary, SU is offering 20% off selected birthday stamps. When you spend $20 in regular catalog merchandise, you'll qualify to purchase any preselected birthday/celebration stamp sets at 20 perent off. Click here to check out the featured stamp sets in this promotion. 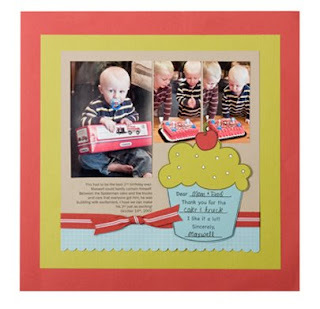 Visit my website for more details on the supplies used in the scrapbook page.